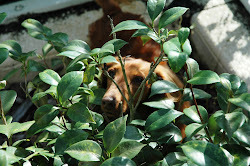 This is a test post using Notepad rather than Microsoft Word. If it works, I will be formatting future blog posts in Notepad. Hopefully this will resolve any issues with the blog software. Thanks for your patience. It’s not often you get to meet new family members as an adult, other than youngsters. I had the good fortune to meet two half-brothers and a half-sister while in New Orleans. It’s a long story, but I was able to connect with Frank, Donna and Donald. 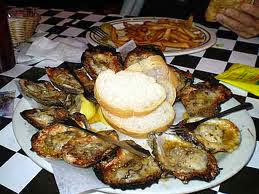 We (and Frank’s Lovely Wife Julie and My Lovely Bride Suzanne) had lunch together at Drago’s (yes, more oysters) and I learned more about my father. He had been a Golden Gloves boxer, joined the Navy in WWII and served on the aircraft carrier USS Ticonderoga. His mother was a Guidry from St. Martinsville, Louisiana, so it turns out that I have Cajun blood that I never knew about. The stories kept coming, and I felt a real connection to my new siblings. They are very successful business people, and run two marine management and transportation companies in Houston and New Orleans. Each of them has four children. Donna had even flown in from Houston, and they made us feel really honored and part of the family. Donna and Suzanne also got to talk about spiritual subjects. It was a very special day. One last stop, though, before we left… back to Morning Call for beignets and café au lait! Part of the fun is shaking powdered sugar all over your beignets, the table and your table-mates! Outside, another unique sign on the side of an industrial-sized dumpster… Only in New Orleans would they have pink dumpsters. On to Pensacola and our home state of Florida! We arrived at the Naval Air Station’s Oak Grove Campground to find two very hateful campsites within 50 yards of the beach. We use the term “hateful” to jokingly describe really beautiful places; this one is tucked away in an oak grove (gee, that was a surprise) mixed with pines. Of even greater import, the oaks were filled with…. SQUIRRELS! We stopped counting after the seventh little furry rodent, and Rudy and Gretchen were soon exhausted from chasing the critters up oak trees. We took a nice walk on the beach, which is typical of this area, very fine white sand, like sugar. 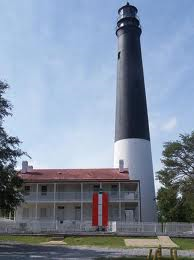 Fort Barrancas, a Civil War brick fort, lies just offshore on a barrier island, and the historic Pensacola lighthouse is just 100 yards away from our campground. The large orange “day mark” is part of a visual range that helps mariners steer their ships into Pensacola Bay; the channel buoys are a few hundred yards off the beach. 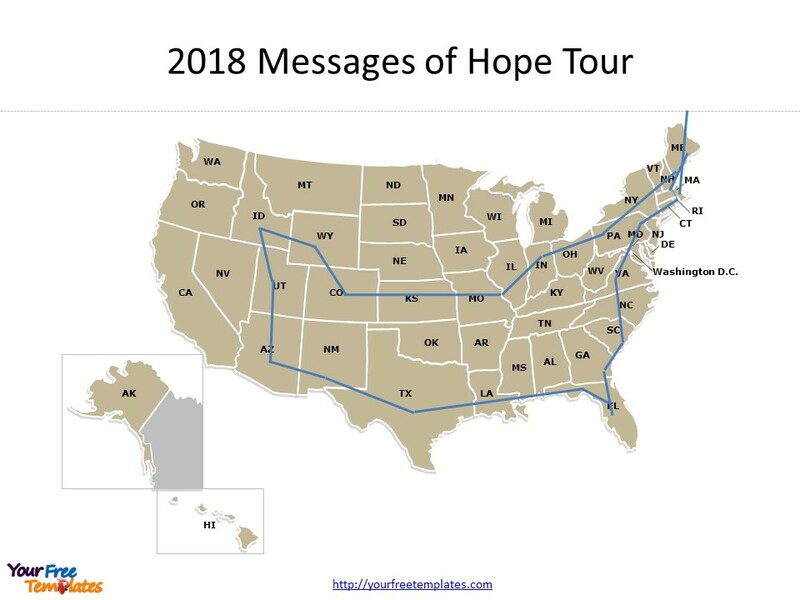 On Sunday, Suzanne gave the message at Unity of Pensacola, followed by her Making the Connection talk. Two women even drove all the way from New Orleans, a four hour trip, to attend. As always, Suzanne’s presentation was very well received. After the Unity events, we were able to sightsee a bit in the historic section of downtown Pensacola. We ate grouper and shrimp dinners at the annual seafood festival, and admired the lovely restored 19th Century homes that are so typical of the Gulf Coast. This would be a delightful place to live (at least during the cooler months). We have been experiencing posting problems on this blog over the past week. You may not have received the email blog, even though they were posted on the web site. We have not resolved the issue with Google, but I hope that this post gets sent out correctly. If not, we may have to find another host. Watch this space for more information. 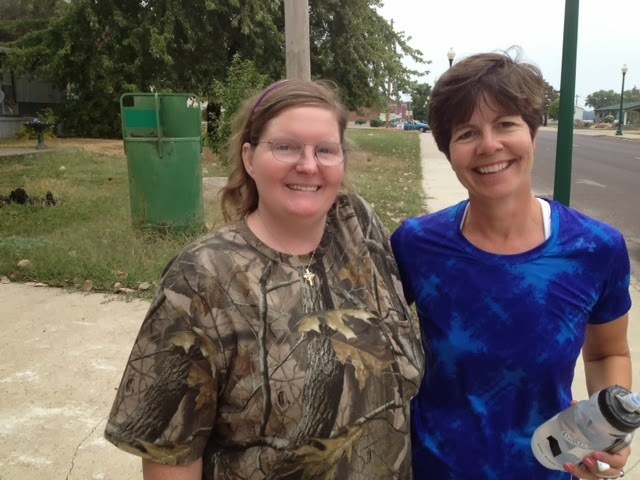 After departing Jackson, Mississippi, we stopped in to visit my sister Karen and her partner Debbie. They have a gorgeous 4 acre estate on the Tchefuncte River in Covington, Louisiana. They are retired nurses, and their house looks like something from Southern Living magazine. Debbie made us a beautiful salmon dinner, and as we were leaving mentioned that she was giving away a lot of canned goods soon. She pointed to a pile on the counter, and my heart raced as I saw a large cellophane-wrapped box of Alaskan Copper River smoked salmon. The conversation went like this: “Debbie, did you err and leave that smoked salmon lying around for five years until it went out of date?” “No, Ty, a friend gave it to us as a gift last week, and it’s too high in salt and sugar from the curing for us to eat.” Sure enough, the box had a 2013 label and a June 2018 expiration date. (I may have been staring and drooling heavily at this point.) “Ty, would you like that salmon?” “Debbie, I would crawl over broken glass for Copper River salmon.” (I learned early in life to never look a gift salmon in the mouth.) And now that salmon is sitting on our countertop, awaiting our arrival home for a celebratory meal. Our next stop was New Orleans. Our neighbors Bob and Jan met us here in their coach for their first-ever visit to the City that Care Forgot. We are camped out in the Elks Lodge parking lot in Metairie, outside the city itself. It’s quieter here, and much less expensive than a commercial campground. It was funny though, because when we arrived, the usually empty parking lot was filled with taxi cabs. The local taxi union was having a vote, and cabs kept coming and going for hours. We briefly detoured to a K-Mart parking lot and waited for the hackneys to clear, finally getting settled in just before Jan and Bob arrived. They were slightly delayed because My Good Friend Bob decided to try a trick I used last year… locking yourself outside of the coach. His electronic door evidently is possessed by a gremlin, and when he stepped outside to hook up his toad, the door locked him out. Since this happened in the middle of the day, rather than at 10:00 PM like we did, I don’t think he gets full points for timing. On the other hand, he made up for his daylight error by leaving his coach running for two hours while he waited for a locksmith to arrive and hand cut a new key. So I guess he gets more total points than I earned, but not by much. In between tasting local cuisine, we did actually do some more sightseeing, like up to Vacherie, Louisiana, on the Mississippi River between New Orleans and Baton Rouge. Oak Alley is my favorite plantation to show visitors. The oaks are over 300 years old, and run from the big house to the levee along the river. This plantation home sold for $60,000 during the Depression, and fortunately has been beautifully restored. Fire destroyed the separate kitchen building years ago, but fortunately the house was not seriously damaged. The walls are 18 inches thick; 12 foot ceilings and lots of windows helped keep the house reasonably cool considering the hot, humid climate here. Our tour guide, Sarah, was eloquent and thoroughly knowledgeable about the history of the Roman family who built the plantation back in the 1840s. Here are a couple of photos of the dining room and master bedroom. Sugar cane fields still ring the house, and several rebuilt slave quarters attest to the dark side of plantation life in the 19th Century. On Thursday evening, we helped Jan and Bob celebrate their 44th anniversary at Venezia’s, a neighborhood Italian restaurant in Mid-City that was a Mafia hangout in the days of Carlos Marcello (and maybe still is?). Our family went there weekly when I was a kid, because my stepfather played poker with the wise guys. (I’m not sure it was good form to beat them at cards too often.) Our next stop was at Angelo Brocatto's Spumone Shop for Italian ice cream. It's located only a few doors from Venezia's, and yes, the wise guys used to hang out there as well. Band Practice; A Broken Heart; A Dog Museum; More Hovels; Millington; Jackson; "Turn Now!!!" I think I had mentioned in a previous blog post that Creve Coeur was named for a legend about an Indian maiden who jumped to her death over an unrequited love. An alternative explanation that I have come to accept is that the city was named for the French-American philosopher Michel Guillame Jean de Crevecoeur. In 1782 he wrote a famous book of essays called Letters from an American Farmer that was the first description of America as a separate country rather than an English colony. He was also the first to describe frontier life and the concept of The American Dream, based on equal opportunity and self-determination. Rudy and Gretchen often get votes on where we go, so it was no surprise when Rudy announced the other night, “Dog-Dad, Gretchen and I would like to go to the Dog Museum.” Well, I was very surprised… I didn’t even know that there was a Dog Museum here. I looked on the map, and sure enough, there it was, in Ballwin, a nearby suburb of West St. Louis. We packed up the pups, and a few minutes later disembarked in the beautiful Edgar M. Queeny County Park, with walking paths, lots of trees and the American Kennel Club’s Museum of the Dog. The 14,000 sq. ft. facility, even larger than Rudy and Gretchen’s traveling kennels, is the historic 1853 Jarville House, which was once Edgar M. Queeny’s residence. He was the former Chairman of Monsanto, and led that company from 1928 until 1960. (By the way, Monsanto was his middle name.) In spite of his wealth, he served as a seaman in World War I. He was also a noted conservationist, and sponsored several nature documentaries. He sold his residence just prior to his death to raise money for a St. Louis hospital, and left no heirs. Rudy and Gretchen wanted to take this dog house home, but we didn’t have room in The Coach. 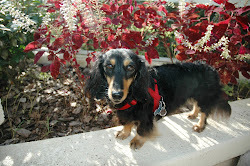 Unfortunately, we missed the special Dachshund Exhibition by a month or two. Now you cat lovers may complain about this mid-America location glorifying our canine friends, but there is actually a Cat Museum, on the Left Coast, in San Francisco (where else would you put it?). We departed St. Louis heading south, and stayed two nights at the Naval Support Activity, Millington, Tennessee, just outside Memphis. We were too tired after a long day driving to go see Graceland or the Peabody Hotel's ducks, so we recharged our mental batteries with a double workout of running and weights at the Navy gym. 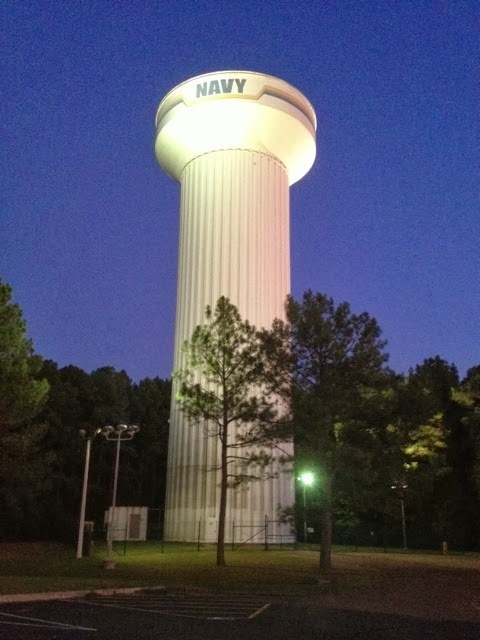 Many towns have their names on water towers, and this one lets you know who lives here! We have just arrived in Jackson, Mississippi, and are camped out in Le Fleur's Bluff State Park, with a water view of the Pearl River. It is a tiny gem of a campground, but subject to frequent flooding. It is named for a French Canadian trader who established a trading post here on the old Natchez Trace; it would eventually become the city of Jackson. 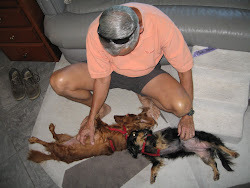 This was an unusual sunset scene that Suzanne caught during our after-dinner walk with the puppies looking for squirrels... there were lots around, and Rudy and Gretchen are in Squirrel Heaven! 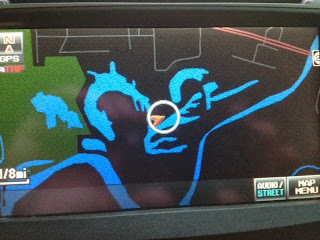 This was the picture of our campground and state park on our GPS when we took a short drive into town. The Pearl River has several ox-bow lakes and ponds that are created when a river meanders and leaves its old channel. We are still headed south from the land of Sven, Ole and Lena... After departing Minnesota, we entered Iowa. The highlight was a stop at this Welcome Center. What better architectural design for this corny state than an old barn? Inside was this Coffee Shoppe, complete with homemade blueberry pie. My Lovely Bride tried unsuccessfully to steer me away from the nice farm lady behind the counter, but I was on a mission... the pie was wonderful! After traveling miles and miles through vast Iowa cornfields, we crossed into Missouri, the Show-Me State. My mother was born in Joplin, and I always enjoy visiting here. Our first stop involved a slight detour to a small town on the Mississippi River to get in a run. Here is the tugboat James F. Neal slowly pushing 12 loaded barges up the river. Mark Twain lived in Hannibal, just an hour or so south, and would have piloted his sternwheeler past the town a hundred and fifty years ago. La Grange (pop. 931) sits right on the river, with most of the town on high ground about 50-60 feet above the river. However, there is no levee here, and there were about 20 houses and businesses right down by the river. 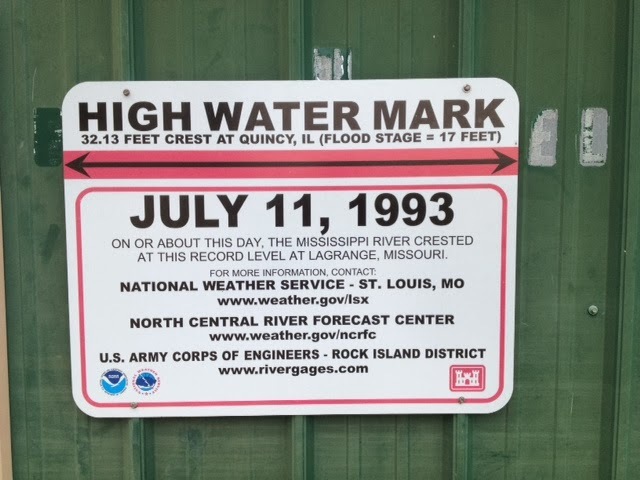 As we ran, we passed this sign on a commercial building along the highway, showing the high level mark in the flood of 1993. 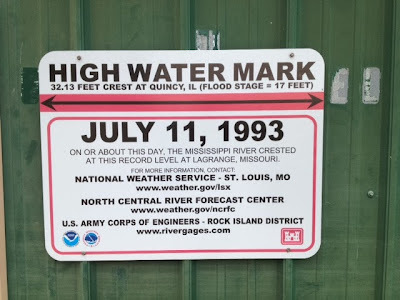 It was a 32 foot crest, 17 feet above flood stage. You would NOT have wanted to be in La Grange on July 11, 1993. 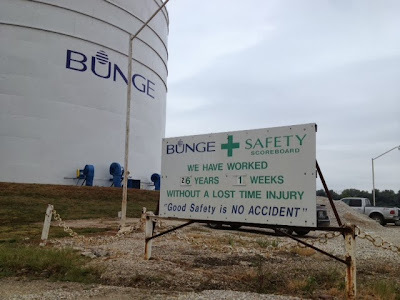 An encouraging sign was this one marking 26 years and one week without a lost time injury at this grain handling facility. That has to be near the best safety record for any port facility I've seen. Bunge is a leading exporter of grains, soybeans, canola oil, and other grain-based food products. We arrived back in St. Louis, where we parked The Coach in the parking lot of the Center for Spiritual Living (CSL). As you may recall, we had stopped here in May on our trip west, and the spiritual community here was the most enthusiastic we’ve ever encountered. Suzanne had received several emails asking her to return soon, and it didn’t take much convincing to get us back. 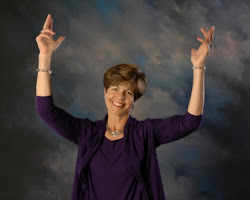 When she spoke in May, CSL’s pastors, Rev. Dr. Marigene De Rusha and her husband Rev. Dr. Larry De Rusha, were in Italy for a wedding. On our return visit, we were fortunate to find them both here. We had lunch together, and while Suzanne and Marigene talked spirituality, Larry told me about his experiences working on nuclear fusion and other science-related projects. He is very interested in quantum physics and how it meshes with spirituality, and is a published author. We are both looking forward to reading his books. Suzanne was able to give two readings while in St. Louis, including one for Marigene. As she stated to her community before Suzanne spoke, it was an amazing reading, with six of her relatives from the other side coming through. Suzanne’s two events, Wednesday and Thursday evenings, were very well attended by CSL’s fantastic community and many first timers. Her first talk was Meaning in the Messages, in which she described many of the highly evidential readings she has given this year and what they mean for us. Suzanne's books were very popular among the St. Louis CSL community, and we were able to reduce the weight we are carrying inside the coach's storage compartments significantly with their help. On Friday evening, just 30 minutes before Suzanne's presentation, our little Dachshund Gretchen snapped at a bee that had gotten into the coach unobserved and was stung on the mouth. Suzanne called her good friend Beth, a veterinarian, who told us to give Gretchen some Benadryl. I drove out quickly to a pharmacy with our little baby and administered her medicine, and she has displayed no ill effects other than hiding under the bed for an hour. But Beth was also important to Suzanne’s new presentation, Heart Gifts. Suzanne had met Beth and her husband Mike when Suzanne spoke at a conference at Edgar Cayce’s Association for Research and Enlightenment (A.R.E.) in Virginia Beach back in May. Like our daughter Susan, their son Wolf had been killed by lightning. Heart Gifts is based on information brought through from Wolf that Suzanne received over several days. She has been working on this presentation for two months, and it was one of the most stunning and inspirational talks I’ve ever heard. (It was the first time I had heard much of this information as well.) She will give the presentation again in Crete in October and at Unity Village and in The Villages in November. Finally, a few words on one of my Pet Peeves… “green” paper towels. I am talking about the very expensive, thin, non-absorbent towels made from recycled paper that are supposed to make you feel virtuous when you buy them. I think that is their only redeeming value, a temporary “feel good” that is dashed when you first tear one off the roll, and instead of tearing neatly at the seam, breaks off in a jagged edge… more often than not. Then you have to use two of them to clean up the same amount of mess that one piece of Bounty would do. They remind me of French toilet paper from the 60s… cheap, non-absorbent, next to useless. Call me “reactionary”, “conservative” or even “Republican”, but I’ll follow Paul Bunyan’s lead and take good old real American sustainable forestry product paper towels every time.